When mum pops one of those chews in her pocket on a walk, I am the most obedient dog ever! Cosmo is a guinea pig who came to see us because his owner had noticed that he had lost weight recently and he was seeming to be uncomfortable when passing urine, squeaking and arching his back. Whilst some dogs bounce in the door with tails wagging and can’t wait to see us, it can be a very stressful time for others (as well as their owners) that aren’t quite so keen. 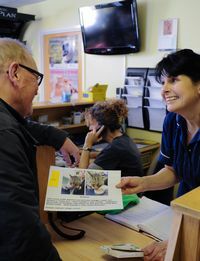 The team at Wangford Vets are determined to make visits to see us as positive as possible and we encourage social visits . A quick test to see if your dog is overweight! Is it time to put your dog on a new year diet? Dogs can gain weight for various different reasons, like overeating, too many treats, or an underlining health issue. No matter what the reason is, an overweight dog is never a good thing and should be addressed as soon as possible. Are your Dogs Microchip Details Correct? Make sure to keep your pets details up to date - and stay together forever. 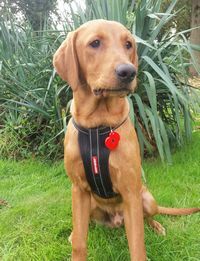 It’s simple to update the details for your dog’s microchip; you can do it online, by telephone or by post – depending on which database your chip is registered to. There are charges for updating your contact details which will vary across microchip database providers. Perhaps this year you’ve noticed your furry friends starting to slow down, go a bit grey, and maybe just prefer being indoors. Just like us, pets do get old, and though that doesn’t mean saying goodbye anytime soon, you may have to think a little differently on how to help your senior pet cope this winter. With the holiday season upon us, it’s time to deck your halls and make your house look merry. It’s fun and exciting to get all festive and break out the tree, but it gets a little stressful when you have a four-legged friend or two in your home. Year after year you spend hours making it look perfect, only to turn your back and find your favourite ornaments broken or your whole tree lying across the floor. Through no fault of their own, black cats are overlooked time and time again, as most people tend to choose grey, ginger and tabby coloured cats. Even black kittens are left until last for adoption, while their more colourful siblings are chosen first. When is itchy skin a sign your dog should visit the vet? Every dog loves a scratch, yes? Dogs itch, but when is a good scratch actually a bad scratch? Sometimes scratching belies a deeper problem that needs proper attention. Here’s what to look out for to prevent your furry friend from any skin-related stress. BBQ season - when it comes to food, dogs simply don't have an off button! A BBQ smells good to us, but a dog’s sense of smell is significantly more powerful than ours, so they are going to find the smell very appealing as they sit at our feet, patiently waiting for any leftovers that may come their way. . The danger here is that fatty BBQ foods plus greedy pets could result in a number of problems that could mean a trip to the vets. Make sure you are ready for the holiday season. 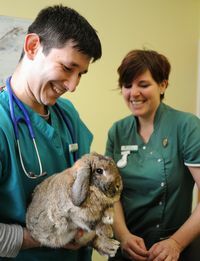 Here is the Wangford Vets’ survival guide to helping you and your pets enjoy a happy, healthy Christmas. Three month old Indi, a gorgeous little Cocker Spaniel was rushed to the surgery in the early hours of the morning by her worried owners. Indi was showing signs of having ingested some form of toxin, she was collapsed and having seizures. Find out how we treated her and helped her to a very happy ending. Vaccination protects our pets against diseases which are very hard to treat. The important diseases with vaccines available are Canines Distemper, Canine Parvovirus, Canine Adenoviruses, Leptospirosis, Parainfluenza virus, Bordetella Bronchiseptica and Rabies. Leptospirosis is spread by rats and found in rivers and streams. Summertime parties and in particular barbecues can be hazardous for your pets. The last thing we want to do is be a kill joy but there are a number of summer barbecue hazards that can be easily prevented, and it’s better to be safe than sorry, so we’ve compiled some tips to keep your pets safe, so we can all enjoy this great British summertime tradition. A frozen filling will provide a cool and even longer-lasting treat that is great especially if your dog needs to be crated when left. It’s also excellent as a cooling and teething treat for puppies. Is your dog suffering from the heat? Make sure you know the signs of heatstroke and what to do. Anyone who has ever had a missing cat knows how worrying it is, not knowing what has happened. Most indoor-only cats tend not to travel far. While an adventurous indoor/outdoor cat is more likely to roam, a scared cat may not trust their inner compass, get confused and get lost. Once a cat has wandered out of their comfort zone anything can happen to scare them further: Barking dogs, wildlife, loud traffic noise, teasing school kids, the list is endless. Losing a pet can be a traumatic experience for any child, Many children love their pets very deeply and some may not even remember a time in their life when the pet wasn’t around. Most owners agree that their cats dislike visiting the vets. The harvest mite is a small orange colored mite that can cause skin irritation of dogs, cats and other animals. Harvest mites are mostly a problem in the late summer months. They hatch out from their eggs in grass and other low vegetation and then crawl onto the host animal – your dog or cat! It’s estimated by veterinary professionals that feeding a dog a balanced diet and keeping his weight down could extend its life by at least two years and dramatically improve their quality of life. Suffolk has 8 beaches listed where dogs are allowed and a further 5 where dogs are restricted in Suffolk. There are 1 beaches in Suffolk on which a dog ban is in operation. Oh the joy of romping on a sandy beach! Splashing in the surf! Wind blowing in your hair, the smell of seaweed and wet sand and the cry of gulls! You and your best friend together regardless of weather. Sounds lovely doesn’t it? And it can be. Most dogs love the beach so make sure you are aware of any potential beach hazards. 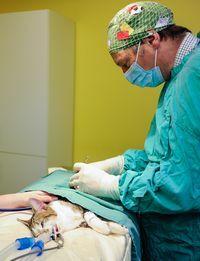 Trips to the vets can be overwhelming for our pets. With lots of unusual smells and uncomfortable prodding the experience can be rather stressful. When those puppy dog eyes get the better of you and before you know it you’re sharing food with your furry friend. Do you know how to spot signs of stress in your dog or cat? It is estimated that 85% of dogs (over five years of age) suffer from gum disease – don’t let your dog become one of them. Follow these four simple steps in our guide to brushing your dog's teeth. 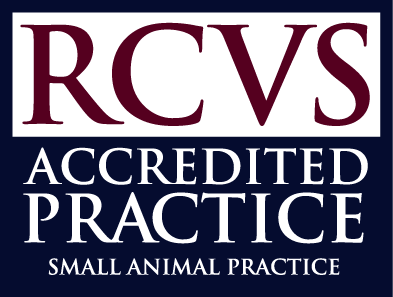 We understand that your pet may be anxious about coming to the vet; we try to help reduce the stress by creating a friendly atmosphere with plenty of treats on hand to reduce their anxieties. 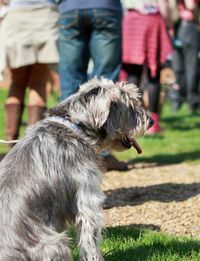 We encourage our clients with dogs to come in whenever they are passing just for a fuss and a biscuit. Some dogs will eat anything! We are continually surprised by the things dogs will eat. Sadly many dogs will suffer pain, permanent damage to body organs, and, in some cases, fatally from swallowing the wrong thing. We thought we would put together a list to help you identify the major hazards in your household. Pet Insurance - Do I need it? Pets bring us a lot of enjoyment, but there are also times when they can make us worry, especially when they get ill. Veterinary care is improving all the time, with more treatments available than in the past, but these treatments can be expensive and when your pet is ill the last thing you want to think about is money. Pet insurance can bring real peace of mind, taking the worry out of this stressful situation. Even so, you should be careful to choose the right company and the right policy for your pet, as there can be a wide difference between them, and this is one occasion when you must read the small print.